Cargo Control & Tie Down Assemblies products from CERTEX USA include a full line of synthetic tie down assemblies and related hardware for all the tough demands of a flatbed or trailer industry. 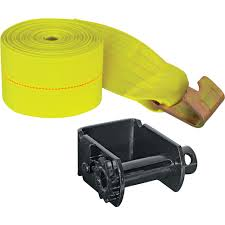 Also available is a full line of cargo control products for pickups and smaller trailer straps used for securing loads. The straps are made from polyester webbing for minimal stretch or resistance to wear. Ratchet load binders offer the ease of one hand tensioning with their high quality ratchet buckles. A variety of tensioning buckles and end fittings are available. The webbing widths range from 1 inch – 4 inches. Many different strengths are available which affect the working load limit of the tie down assembly. Unless otherwise stated, the strength rating is based upon a straight tensile pull. All tie down assemblies are tagged with a working load limit. CERTEX USA recommends that these products be used in accordance with state and Department of Transportation regulations and rules.